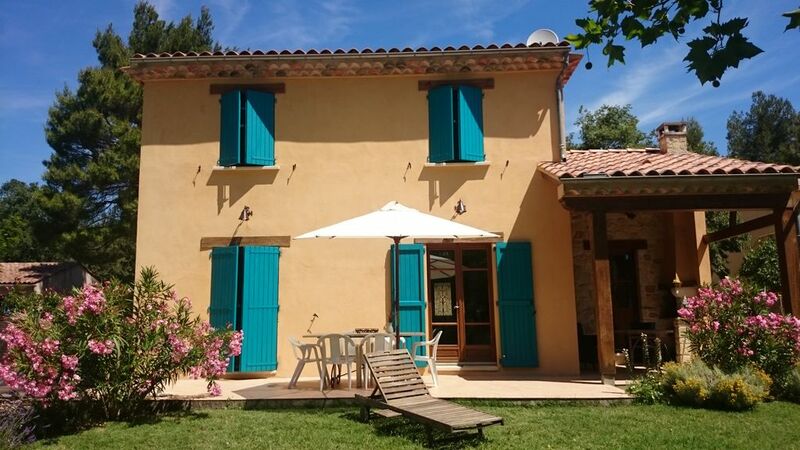 Lovely house in the Luberon with a pool in a charming location. To fully enjoy your holidays under the Provence sun, this magnificent charming Provencal house will welcome you all year round. In order to rest and enjoy your family, you will benefit from a peaceful and very comfortable place, a large garden planted with trees giving Mediterranean essences (offer scents and shade that cannot be compared) and a beautiful swimming-pool with its wooden terrace to rest. You can take your meals in the beautiful covered terrace with its barbecue. The charming bathroom has the typical Provencal style, with a rustic cast iron bathtub free-standing and a spacious walk-in shower (for 2) with a big shower head. Fantastic location for hiking, dog walking and exploring Provence! We had a wonderful stay at Hélène et Thierry place in Le Bastide de Jourdan. It ticked all the boxes for us in terms of location and size - a wonderful enclosed garden the dog could enjoy, a covered pool, BBQ. The village itself was charming. We'd walk to the bakery most days and then did plenty of hikes nearby. We also explored Bonniuex, Lacoste, Colorado Provencal, Aix en Provence all easily reachable by car. Hélène et Thierry ended up staying in the small converted house on site which wasn't a problem for us but we weren't told about this beforehand nor the cleaning which was asked for in cash for when we departed. We ended up getting up early and cleaning ourselves as there had only been the two us and it was no problem. Would recommend travelers check these details with the owners beforehand to avoid any complications. A great place and would definitely recommend. A very nice house with pool in the Luberon. We spent a week here - actually we spent most of our time out hiking or visiting the market towns, but the house was ideal - a cool retreat from the heat of the day, with a small pool to relax after a day in the hills. The kitchen has everything needed, plus a gas barbecue, and there's a very attractive family bathroom with shower/wet room and roll-top bath. The lovely Helene and Thierry were great hosts, and gave good advice on things to do: Thierry is a hike/bike guide. Best things: the market at Forcalquier and the Gorge de Regalon. The pizza restaurant at La Granons is really good too. We spent one week in the Provence and really enjoyed our stay there. The house is beautiful and very charming. There is everything you need to make your stay comfortabel. The garden is really nice to relax and play Boule etc. and the pool is very clean and has already had 26°C (in May)! We really want to come back! Thanks a lot for your appraisal. We are glad that you liked your holidays in Provence in the house. Lovely 3 bedroom house. Good sized rooms and bathroom and shower. Enjoyed a very relaxing week. Patio perfect for eating lunch and dinner. Pool not heated but nice size. Small village very close by with delightful boulangerie and good restaurant. Charming owner. Only difficulty was the WiFi connection which was dodgy. No hesitation in recommending. The home is just as pictured. It is a newer home in a small, quiet village with a very good bakery. Makes a good base for exploring the Luberon. Aix-en-Provence is just 45 minutes away. Or just stay at home and relax! The bedrooms are located upstairs: 2 with double beds and 1 with two twin beds. Note that the staircase is steep and open (no railing), so use caution with small children on the stairs and consider blocking the stairway for safety. The pool is not heated, but it warmed in a day or two by using the cover and was nice on the hot days. Keep in mind that if you have young children the pool is appx. 1 - 1.25 meters deep. There is an alarm set up on the pool, but you should watch your child anyway. The home is clean and comfortable. The upstairs bathroom has a nice shower and bathtub. There are neighbors next door on both sides, but there is privacy fencing. It is a quiet neighborhood. We enjoyed our meals on the patio with the pastoral views and warm Provence breezes. The housekeeper was very helpful and cheerful, and speaks English. Thank you Marie! I give it 4 stars not 5 only because of the cautions for our children ages 4 and 7, but we would return again when they are older and taller. The home is perfect if you have older children. We wish we could have stayed and lingered longer! Thanks for your very nice assessment. I’m glad that you spend good time at La Bastide. I took note of your recommendation and I will install a removal guardrail for the staircase to secure the small children. Regarding to the pool, it’s an above-ground pool so a natural barrier against accidental fall of young children. Au calme et au chaud ! Super vacances en famille ! Très beau gîte spacieux, au calme et très propre. Literie au top! La météo ne nous a pas permis de profiter du jardin sans vis-à-vis ni de la piscine, alors on a profité de l'agréable chaleur de la cheminée ! Merci à Thierry, Hélène et Arthus ! Lovely villa located in the country on a large plot of land planted with trees, not isolated. Less than 1 km away from the Bastide-des-Jourdans, a small typical village of the Aigue region in south Luberon where you can go shopping by foot (grocery shop, bakery, greengrocer, bar, tobacco shop, newsagents) and visit its old town. The villa is close to beautiful perched villages where you can stroll in the Provencal markets like Lourmarin, Cucuron Ansouis... Shopping centres are 15 min away by car.